Today’s post is a guest blog from a colleague: Eric Dobler, founder of Dobler College Consulting in Cheshire, Connecticut. For twelve years Eric has been working with college-bound high school students and their families as a college admissions counselor and academic advisor. I often have students ask me if they should submit a resume with their college applications. Some feel they might be doing too much by enclosing a resume while others fear a resume won’t say enough about them to even matter. My take on it is that resumes, or activity lists as some like to call them, can be quite valuable IF the college wants you to submit one and IF you make sure that it actually provides value in your application. The job of an admissions counselor is to try to evaluate and understand each applicant as best as they can in a very short period of time. Your grades and SAT scores are the quantitative piece of this review. They allow the person reviewing your file to get a feel for your abilities as a student. However, it is the qualitative parts of your application, such your resume, which afford you the opportunity to show what kind of person you are. Some colleges, mostly large state schools who have incredibly large applicant pools, rely more on a student’s grades and SAT scores when they render decisions. In fact, when you look on their websites, you may often find that they don’t mention anything about applicants needing to submit a resume. If this is the case, don’t stress about putting one together. Chances are, it won’t be used in the review of your application anyway. On the other hand some colleges, like smaller private, liberal-arts schools and the most selective schools in the country, will review a resume and may actually go looking for very specific information. And this is where the value piece of the equation comes into play. If someone is going to read your resume, you need to make sure it reveals things about you that matter. A resume that simply repeats information you have already provided in the application does not matter. How do you make sure that your resume matters? A well-written resume will showcase the activities you are most passionate about and it will be apparent to the reader for two reasons. First, the activities should span not just one semester of involvement, but several and second, they will contribute towards your brand. Whether the activities are sports, student clubs, internships, volunteer work or even part-time jobs, colleges want to see that you’ve done things because you care about them. Not because you want to pad your college application. It’s a simple equation of quality over quantity. How long were you involved in this activity? Were you actually involved in the activity or did you just sign up because your best friend did? Did you hold a leadership position? Did you like the activity? Did you love it? Is it relevant to what you think you want to major in? Once you’ve done this, you can then organize everything into easily identified categories such as High School Organizations, Athletic Teams and Non-School Service. Pay special attention to awards, honors, and leadership positions. Make sure you include how many years you were involved and even the number of hours you invested in each activity on a weekly basis. Also make sure you include your name, address and contact information at the top in case your resume gets separated from your application somewhere along the way. At the end of the day, your resume can be a very helpful piece of your application if, and I stress IF, the college you are applying to wants to see one and IF you have compiled a list of activities that truly matter to you. If you have any additional questions on resumes or would like some assistance on putting one together, shoot me an email at eric@doblercollegeconsulting.com. 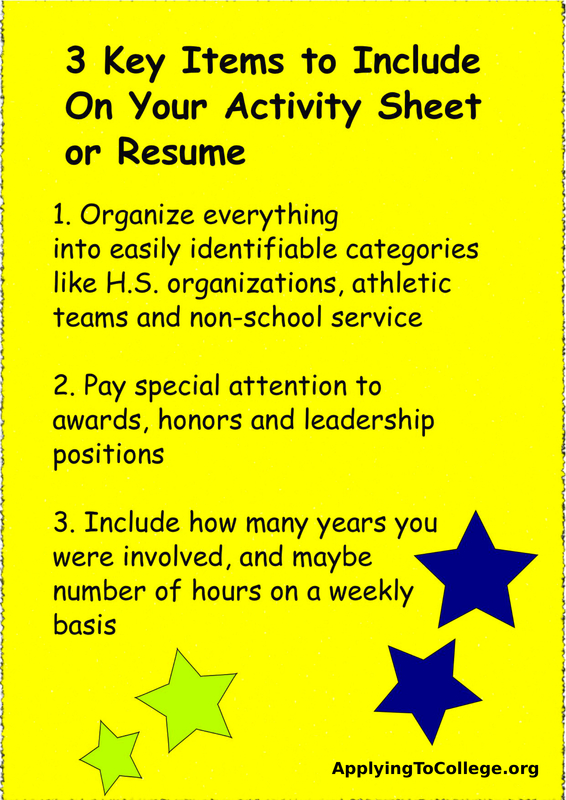 Resumes and Activity Sheets: Good Idea When Applying to College? Categories: Application Process, Resumes and Activity Sheets | Tags: activity sheets for college applications, eric dobler college consulting, how to write a college resume, Should you submit a resume with your college application, what to include in your college application resume | Permalink. Great article. I’m dealing witgh soome of these issues as well..